Hack 3 | HACK It! The atom bomb was dropped on Hiroshima August 6, 1945 and Nagasaki on August 9, 1945 by the United States which ultimately ended World War II; also killing almost 129,000 people by doing so. I found this picture and thought it was relevant to what’s been talked about in lecture this week. Ever since the atom bomb was dropped, it has been in ads, on television, in movies, in papers, books, pretty much all the news; and usually displayed as a joke. 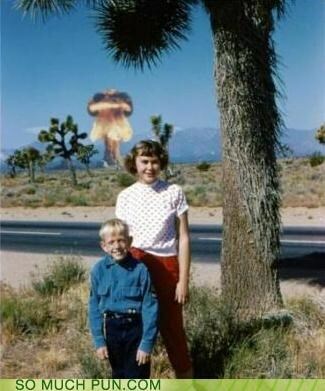 This picture shows how these two children instead of being shocked by the immensity of the bomb, are smiling in front of it.